As many of you know, I’ve been scratching around for some time trying to dig up the origins of the Military Grid Reference System (MGRS). I recently became interested in it in light of the fact that the US Geological Survey and Department of Homeland Security have adopted MGRS as the grid standard for the continental US (they’re only 60 years late, but who’s counting!). I had some old friends at Fort Bragg who are involved in the mapping & charting field root around and they came back with the opinion that development of MGRS was likely tied to NATO and NATO standard agreements (STANAGs as we used to call them). There is probably some truth to that, but there were still several pieces of the puzzle missing. One of those was just when the US Army adopted MGRS. For the past several months I’ve been scouring eBay, purchasing early copies of US Army map reading and land navigation manuals. The first official, general issue map reading manual came out in 1938 (Basic Field Manual Volume 1, Chapter 5, Map and Aerial Photograph Reading) and was quickly followed by updates in 1941 and 1944 as FM 21-25. Tucked away in the back of my 1944 copy of FM 21-25, Elementary Map and Aerial Photograph Reading were two changes that I never paid much attention to. 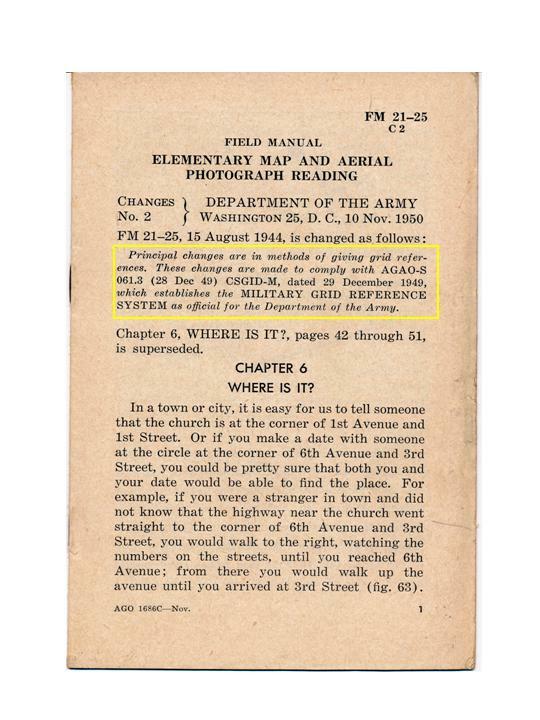 ‘Changes’ in Army parlance were updates to manuals or other documents. The Army would publish a change in the form of an addendum and distribute it throughout the Army. It was the individual unit’s job to make sure all the changes were ‘posted’ (this usually meant you physically attached the change document to the base document by some means, like stapling). That’s how the military managed publication changes before this internet thingey came along. So there you have it. The Army adopted MGRS in December 1949. Part of the mystery solved! So now I know the why and the when. What’s still missing is the how. MGRS is based on the Universal Transverse Mercator Grid (UTM), which was developed by the Army Map Service sometime right after WWII. What I need to find now is the original description of UTM and MGRS, the document prepared by the Army Map Service describing how MGRS is calculated and constructed, and how it should be implemented. My guess is that these founding documents are buried deep in the archives of the National Geospatial-Intelligence Agency (the descendant of the Army Map Service). Anybody know someone at NGA who can spend a lunch hour digging around for this info? This entry was posted in History, mapping, Military and tagged mgrs by Brian Haren. Bookmark the permalink. John, thank you so much! I’ve been searching for that information for a long time. You’ve filled in an important gap in the history of a grid system that has not only remained relevant for over 65 years but is now flourishing with the adoption of the US National Grid.